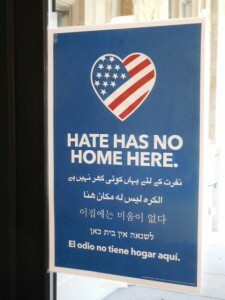 This ‘Hate has no home here’ sign is visible at the West Seventh Street entrance to the First Presbyterian Church of the Covenant in Erie, PA. When you walk into the West Seventh Street entrance of the First Presbyterian Church of the Covenant in downtown Erie, PA, there is a distinctive sign on the door that delivers a clear message. 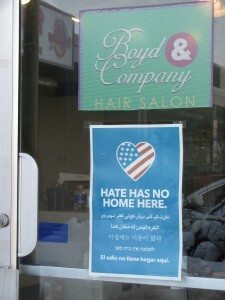 It reads “Hate Has No Home Here.” This poster is also displayed around Erie at various businesses and other places of worship. Erie “One Table” held an event last year and made the posters available in response to an increase in incidents targeting the Jewish and Muslim communities across the country. Then, a gunman entered the Tree of Life Synagogue in Pittsburgh’s Squirrel Hill neighborhood last October, killing 11 congregants and injuring several others including police officers. Seph Kumer, Director of Community Engagement at First Covenant, said after the deaths in Pittsburgh, in a house of worship relatively close to Erie, it was time to send a clear message here. George Boyd is the owner/operator of a hair salon in west Erie. When he was asked to consider placing the “Hate Has No Home Here” sign at his business, he did not hesitate. “In the past few years I’ve noticed a marked increase in anti-Semitism and anti-Muslim rhetoric,” he said. “During the 2016 presidential campaign and subsequent election, these sentiments seemed to skyrocket. In my business, educated women began to feel open to expressing these concepts. “I grew up in a community of people of conservative Jewish faith. Though a Christian, the idea of anti-Semitism was quite foreign to me. All my preschool neighborhood friends were Jewish. I try to understand people who did not have the opportunity for the best education and little experience with diversity harboring these views but was shocked to hear hateful comments of bigotry from the retired school teachers with master’s degrees who had been directly responsible for educating young minds. In the fall of 2016, residents in the North Park area of Chicago wanted a way to peacefully protest the divisiveness that erupted after the presidential election. 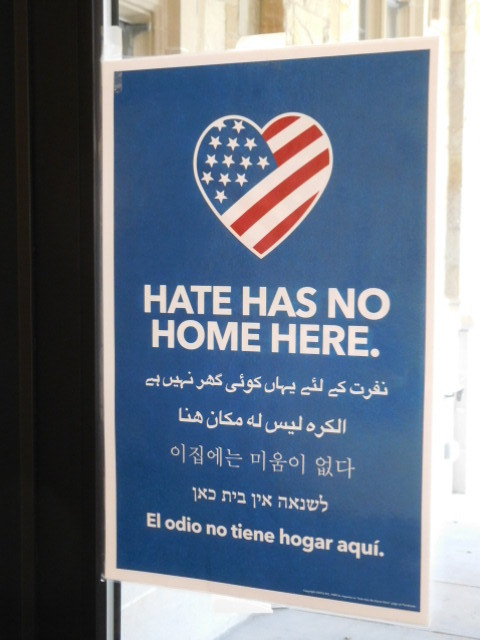 In response, a third-grader came up with a message that declared, “Hate Has No Home Here.” A local graphics designer created a poster with this message on a blue background and a stylized American flag inside a heart. The message is written in six languages. As the Chicago Tribune reported on Feb. 2, 2017, this poster was so popular it went viral around the country and around the world and crashed the North Park neighborhood organization’s website. The “Hate Has No Home Here” message resonates through the stone walls at First Covenant and throughout the West Bayfront Neighborhood where economic disparity is prevalent. To the east is Gannon University, which has many international students from India, the Middle-East and elsewhere around the world. Erie Insurance is headquartered just to the east of the Gannon campus and is now the largest employer in the City of Erie, employing IT and cyber security workers and plans to hire more. Back at First Covenant, the church has opened its doors for the last seven winter seasons for “Our Neighbor’s Place Overflow Shelter.” During two-week sessions, volunteers organize nightly accommodations, a hot meal and a safe place to stay for those who would otherwise be outside during an Erie winter. About five years ago, First Covenant began providing a weekly hot supper on Sundays for those in the community who are food insecure and who would otherwise not have a meal that day. This is the Sunday Supper program that brings together volunteers from across Erie County to provide a meal on Sundays to those who would go without, if not for this outreach ministry. For the Rev. Chris Weichman, pastor of First Covenant, the message, like the blue poster on the door, is clear. First Covenant has plans to further develop its outreach.